Our goal is to be a turnkey source for taking your complex manufacturing project from start to finish with impeccable precision. At Iridium Manufacturing, our team members model prototypes and create custom tooling around the client’s final part data. Such design capabilities allows Iridium Manufacturing to design to-part data, and adapt as client’s needs change, maintaining project timelines and the bottom line. Current versions of Visi modeling can handle multiple file formats to ensure there is never a data or translation issue between the client’s data, and what Iridium Manufacturing receives to process. Utilizing state of the art CAM software, Iridium Manufacturing is able to move from on-screen concept to machining a new part; in turn minimizing setup and engineering on a project. CAM Tool allows for multiple tool path generation, rapid traverse on machining, and crash avoidance and protection - ensuring the part will be machined correctly the first time, while adding an extra layer of protection to a client’s time sensitive project. CNC machining is a manufacturing process where the machine tool is controlled by computers through programming vs. manually by hand. 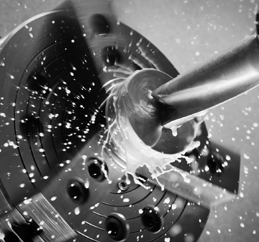 Typical CNC machines are multi axis, mills, lathes and grinders. Using the latest, state-of-the-art CNC machines, coupled with advanced CAM software, we are able to work with difficult materials like stainless steel, copper, titanium, and more with complete accuracy and precision. Wire EDM or Electrical Discharge Machine is a manufacturing process that erodes a shape in metal by running a current between two electrodes. Wire EDMs are high precision machines that can hold tolerances to 0.0002" or better. Iridium Manufacturing is your turn-key manufacturing and project management partner! From one off prototypes to custom machines, Iridium Manufacturing offers an all-encompassing manufacturing presence, taking your project from cradle to grave. Our commitment to accuracy and on-time delivery is supported with comprehensive oversight and quality control to ensure that we exceed expectations and meet specifications from the initial quote, to the design reviews, data management, execution, final inspection, and shipment. For more information, or to request a quote for your project, call Iridium Manufacturing today at (586) 884-6441. We’re located in Sterling Heights, MI and service Oakland, Macomb and Wayne Counties.